Artifactory offers a universal solution supporting all major package formats including Maven, Gradle, Docker, Vagrant, Debian, YUM, P2, Ivy, NuGet, PHP, NPM, RubyGems, PyPI, Bower, CocoaPods, GitLFS, Opkg, SBT and more. Through a set of plugins, Artifactory is tightly integrated with all major build tools and CI servers including Maven, Gradle, Ivy/Ant Jenkins, Team City, Bamboo and TFS. Artifactory provides full metadata for all major package formats for both artifacts and folders. These include metadata that originates with the package itself, custom metadata added by users such as searchable properties and metadata that is automatically generated by tools such as build information and more. Full active/active HA solution with live failover and non-disruptive production upgrades. Supports a variety of enterprise-scale storage capabilities including S3 Object Storage, Google Cloud Storage and filestore sharding providing unlimited scalability, disaster recovery, and unmatched stability and reliability. Accommodates large load bursts with no compromise to performance. Increase capacity to any degree with horizontal server scalability to serve any number of concurrent users, build servers and interactions. Secure deploy and download. Use a detailed permission schema per user or group (read, deploy, delete, annotate, manage and admin) to exercise fine- grained access control over repositories. Authenticate with industry standards like LDAP, HTTP SSO, Crowd, SAML, OAuth and more. Artifactory uniquely uses checksum-based storage where all metadata is stored in the Artifactory database. This means that any operation on an artifact is implemented through a quick database transaction resulting in up to 5 times better performance than competing products. Artifactory offers several options for on-premise installation (Zip, Debian, RPM, Docker image and Homebrew), as well as a SaaS solution hosted on either AWS or GCP. The Artifactory license is per server and allows an unlimited number of users and repositories. 24/7 SLA-based support for any time zone with unbeatable response times. Artifactory lets you create any number of Docker registries per instance. Use local repositories as secure private Docker registries to distribute and share Docker images across your organization with fine-grained access control. Proxy and cache remote Docker registries with remote repositories, and aggregate local and remote Docker registries under a single virtual Docker registry to set up a Docker promotion pipeline. Annotate Docker tags and images with searchable properties. Use distribution repositories to directly upload packages to JFrog Bintray for distribution. Artifactory stores exhaustive metadata for all build artifacts deployed to it. With this “bill of materials” it is easy to faithfully reproduce a build, and trace the cause of issues to reduce time to resolution (TTR), even if the build is already in production. Using custom properties and user plugins, Artifactory can support custom behavior, triggered by virtually any action on an artifact, as required by an organization, to accommodate any custom lifecycle policy. AQL gives you unprecedented flexibility in how you search for artifacts. It offers a simple way to formulate complex queries that specify any number of search criteria, filters, sorting options and output fields. Encapsulate any number of repositories making them seamlessly accessible from a single URL. Control which repositories can be accessed by different developers and set up a promotion pipeline. The benefits of using a Binary Repository Manager in your software development pipeline are unarguable. Reliable and consistent access to remote artifacts, integration with your build environment, distribution of artifacts and replication of repositories are just a few of the reasons. The repository managers available on the market today can be split into two main categories: Technology specific solutions and universal solutions. Each of the different packaging technologies has a client application which developers use to build their packages. These applications provide different services like package management, dependency resolution, uploading packages to private or public repositories and more. In the case of Docker, there are several solutions for managing images. As the popularity of Docker grew, the demand for a simple solution to securely store Docker images increased accordingly. This started a wave of repository managers that are focused on storing only Docker images, with a relatively limited set of features mushrooming on the scene such as Docker Trusted Registry, Quay, Amazon ECR and Google Container Registry. The key point to note for any of the solutions is that they offer (to some extent) repository management services for one technology only. Universal solutions support a wider range of package formats, build tools, technologies and features. Artifactory is an excellent example, currently supporting Maven, Gradle, Docker, Vagrant, Debian, YUM, P2, Ivy, NuGet, NPM, PHP, RubyGems, PyPI, Bower, CocoaPods, GitLFS, PHP and more, as well as all common build tools and CI servers. Another example is Sonatype Nexus which also supports a variety of package formats and technologies. However, there is a fundamental difference between these two products. While Nexus started as a Maven companion and then added support for other formats, Artifactory was designed from the outset with the flexibility to support different packaging systems and technologies. This fundamental difference comes to bear when you compare the products. While a dry comparison matrix of these two products might indicate they have similar feature set, a deeper investigation reveals significant differences in their fundamental architecture and a very different level of support for different packaging formats. This paper presents key points for comparison of Artifactory to some of the competing products in the market. Products that were examined for this comparison include Docker, Docker Trusted Registry, Nexus 2, Nexus 3, Quay, Amazon ECR and Google Container Registry. A shallow comparison matrix of these products may indicate that they are very similar, however, if you dig a bit deeper, you’ll find that what looks the same on the outside may be very different on the inside. No single packaging format or technology is sufficient to support development in a modern organization. There is a multitude of formats, a variety of build tools, different continuous integration systems and other technologies that go into building a flexible and maintainable software development ecosystem. Managing binaries for all the different packaging formats and integrating with all the moving parts of the ecosystem can become a tooling and maintenance nightmare. With Artifactory, there is no need to manage development with each different package format using a dedicated solution. Artifactory was designed from the ground up to fit in with any development ecosystem. Uniquely built on checksum-based storage, Artifactory supports any repository layout and can, therefore, provide native-level support for any packaging format. Essentially, regardless of the packaging format you are using, Artifactory can store and manage your binaries, and is transparent to the corresponding packaging client. Artifactory currently supports the following packaging technologies: Maven, Gradle, Docker, Vagrant, Debian, YUM, P2, Ivy, NuGet, NPM, RubyGems, PyPI, Bower, CocoaPods, PHP, GitLFS and more. But development is only one end of the software delivery pipeline. Before a package makes it into a product, it needs to go through processes of build and integration. There are many build and integration tools on the market, but there is only one product that works with them all. Through a set of plugins, Artifactory provides tight integration with popular CI systems available today such as Jenkins, Bamboo, TeamCity and TFS. These systems use Artifactory to supply artifacts and resolve dependencies when creating a build, and also as a target to deploy build output. And to support cloud-based CI systems on which you are not able to apply plugins, Artifactory provides plugins for the build tools you use (such as Maven and Gradle) which ultimately provides the same level of build automation. 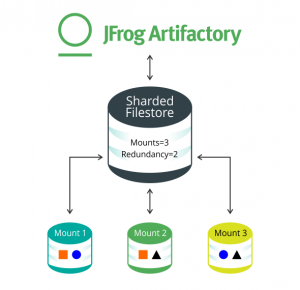 JFrog Artifactory is just one component of a complete and tightly integrated end-to-end solution for artifact management available through JFrog’s suite of products. As a complete solution to an organization’s software delivery pipeline, Artifactory works seamlessly with the other products in the suite. 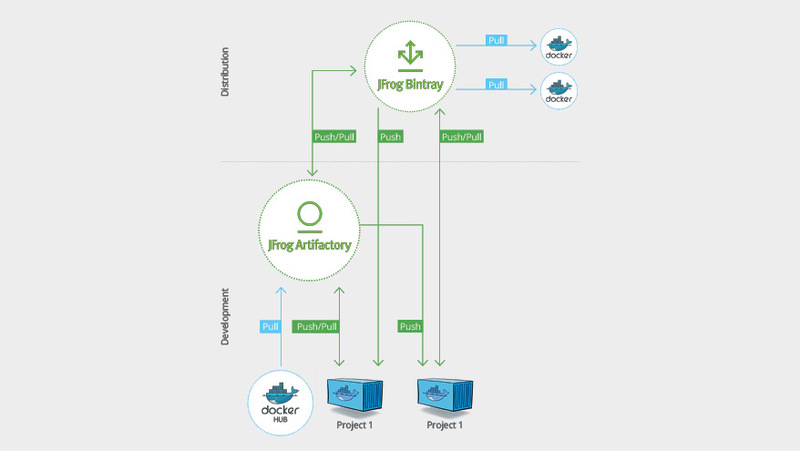 Bintray is JFrog’s software distribution platform that natively supports all major package formats allowing you to work seamlessly with industry standard development, build and deployment tools. To learn more about JFrog Bintray, please visit jfrog.com/bintray. Mission Control offers centralized control, management and monitoring for all your enterprise artifact assets globally. By providing a clear and instant picture of the relationships and flow between your different development organizations, Mission Control provides your IT and Ops leaders real-time visibility into your worldwide development, distribution, and consumption of software packages. 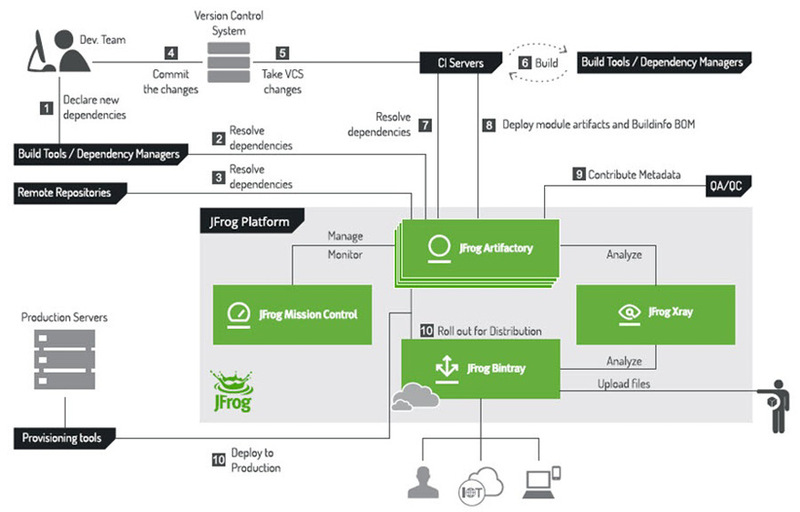 To learn more about JFrog Mission Control, please visit jfrog.com/mission-control or download the whitepaper at jfrog.com/support-service/whitepapers/. Xray works with JFrog Artifactory to analyze software artifacts and reveal a variety of issues and vulnerabilities at any stage of the software application lifecycle. By scanning binary components\ and their metadata, recursively going through dependencies at any level, JFrog Xray provides unprecedented visibility into vulnerable components lurking anywhere in your organization. To learn more about JFrog Xray, please visit jfrog.com/xray or download the whitepaper at jfrog.com/support-service/whitepapers/. Playing such a central role in the management of binaries, your Binary Repository Manager can become a mission-critical component of your organization meaning that any downtime can have severe consequences. 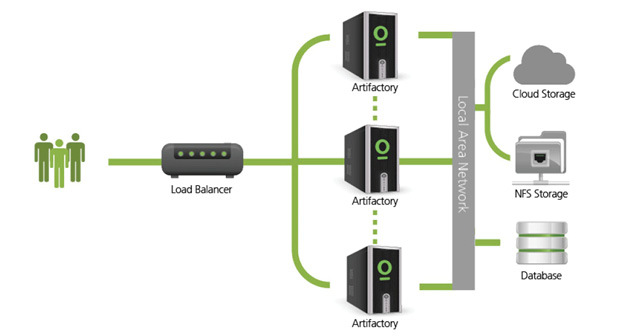 Artifactory is the only Binary Repositor Manage available that supports a High Availability network configuration. With a cluster of 2 or more servers on the same Local Area Network, Artifactory maximizes your uptime and can take it to levels of up to “five nines” availability. The redundant server architecture enables non-disruptive upgrades and allows your system to accommodate larger load bursts with no compromise to performance. With horizontal server scalability, you can easily increase your capacity to meet any load requirements as your organization grows. to simultaneously replicate a local repository to multiple, geographically distant target sites. Artifactory offers a variety of options for storage, and allows complete freedom to combine different storage solutions to meet the needs of enterprises at any scale. disaster recovery capabilities offered by the storage provider. redundancy (R), where R <= M.
mounts can support the redundancy configured (i.e., M >= R). mounts according to the redundancy configured in the system. Artifactory provides reliable and consistent access to packages for secure upload and download. industry standards such as LDAP, HTTP-based SSO, Atlassian Crowd, SAML, OAuth and more. Artifactory optimizes storage by ensuring that any binary is only stored once on the file system. Rather than storing the file in its original name under a specific path, Artifactory creates a checksum of the file (MD5 and SHA1) and renames it to its checksum. All the metadata about a file is then stored in the Artifactory database. Using checksum based storage, any operation done on an artifact (copy, move, delete) is actually implemented by changing the metadata stored in Artifactory’s database. Since database transactions are much faster than file system operations, this results in a performance boost that makes Artifactory up to 5 times faster than competing products. collection. Now consider promoting your builds through your deployment pipeline. This means copying or moving what may be hundreds of Megabytes from one repository to another; an operation that can take several minutes, and locks files in the process. And if you’re doing this several times a day, it can really interfere with development. In Artifactory this is a quick database transaction which is effectively instant. • Instant setup and configuration – you are ready to go within minutes. • Stay up-to-date with the latest version and all the features of Artifactory Pro. • Reduced hardware footprint since there is no server that you need to buy, install, configure, maintain or monitor. • Secure and reliable since all hardware is fully redundant and constantly monitored. • Periodic backups are run for your repository content and configurations. • Privacy and protection. Your data is securely accessed via SSL. JFrog offers the most competitive pricing model available on the market today for repository management. You only pay once for each instance of Artifactory. There is no limit to the number of seats or users per instance. Once you have taken the Artifactory path, you never walk alone. • Customer support portal with a detailed knowledge-base that is constantly updated, and instant access to follow your cases and contacts. contributor to our extraordinary customer retention rate. Artifactory provides full automation control over your repository management and release life- cycle through an extensive set of powerful REST commands some of which are also wrapped in a Command Line Interface. • Performing maintenance tasks such as backups, import, export and more. threads which helps your automated builds run faster. JFrog CLI optimizes both upload and download operations by skipping artifacts that already exist in their target location by checking the artifact’s checksum. If it already exists in Artifactory’s storage, the CLI skips sending the file, and, if necessary, Artifactory only updates its database to reflect the artifact upload. Artifactory supports both Docker V1 and Docker V2. for Docker development with clear separation between development, staging and production environments, as well as separation between different projects and teams. Artifactory offers the option to tag artifacts and folders with searchable properties and provides build information as part of the CI server integration. This facilitates efficient search for Docker images based on their metadata using Artifactory Query Language (AQL). Artifactory’s support for multiple repositories for any supported package format lets you set up a promotion pipeline where packages are moved from one repository to the next as they pass through the different quality gates, up the pipeline defined in your organization. The final step in this process is releasing approved packages for distribution to end users. Artifactory supports a fully automated distribution pipeline through Distribution Repositories. 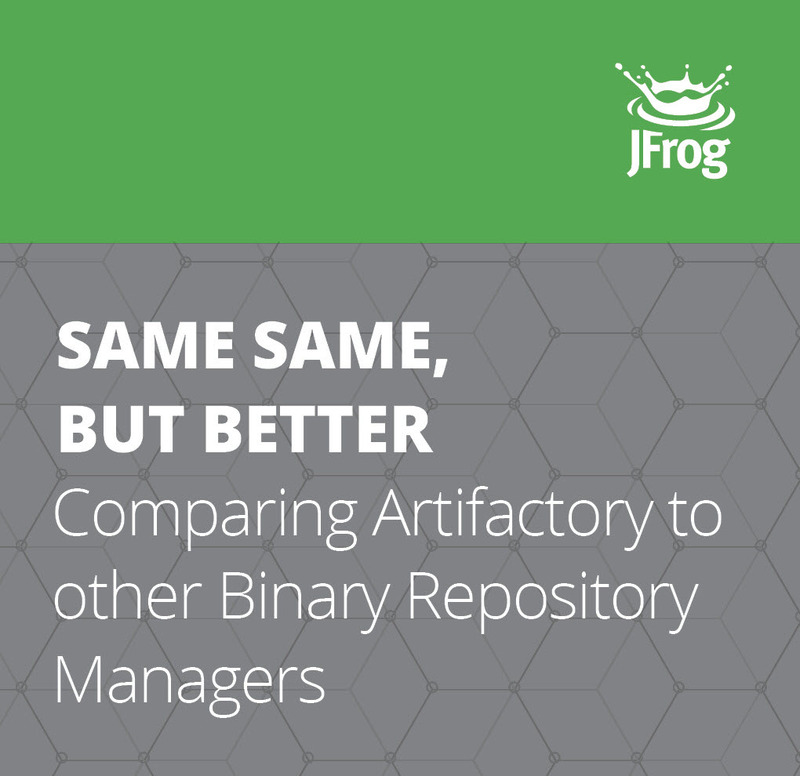 Distribution repositories are tightly integrated with JFrog Bintray. They are governed by a set of rules that clearly define how any package promoted to them should be routed to its corresponding repository in Bintray. Like Artifactory, Bintray offers native support for all major package formats which means, for example, that you can upload your Docker images to private or public Docker registries for distribution on Bintray. Together, Artifactory and Bintray offer the only solution for full lifecycle artifact management – from initial development phases through to distribution of finalized production packages. Bugs discovered in production can become nightmares that are urgent to fix. But to fix bugs, it’s important to recreate the exact build and the environment in which the bug was reported. Artifactory is the only Binary Repository Manager that stores exhaustive metadata based on inherent package properties, custom user properties and automatically generated build information. These include specific artifact versions, modules, dependencies, system properties, environment variables, user information, timestamps and more. With this “Bill of Materials,” it is easy to faithfully reproduce a build at any time. Moreover, with built-in “Diff” tools you can compare builds and therefore know exactly what changes were introduced from one version to another. No product can provide every feature that customers want out-of-the-box. However, it’s important to provide tools that allow each organization to customize your product to meet their specific requirements in the development cycle. With Artifactory, you can define a custom property for each of these gates to determine if a build is ready for production or not. You can find all production-ready builds through the Artifactory UI, but more importantly, your build tools can automatically determine which builds can be promoted to your production repository. User Plugins allow developers to implement custom behavior that can be triggered by virtually any action on an artifact. Together with custom properties, user plugins make it easy to support any workflow required by your organization. To keep things simple, user plugins are written as Groovy scripts and have a simple Domain Specific Language (DSL) to wrap them as closures. Plugins can, therefore, be developed very easily and be deployed on-the-fly with no downtime. While other repository managers do support user plugins, they must be written in Java which makes it more complicated. In many cases, due to this added complication, many organizations just don’t bother writing plugins, and adhering to organization policies becomes a manual process. Unique to Artifactory, AQL gives you unprecedented flexibility in how you search for artifacts. It offers a simple way to formulate complex queries that specify any number of search criteria, filters, sorting options and output fields. And as a RESTful API which uses data streaming to provide output data, it is extremely fast and efficient with unbeatable response time and low memory consumption, which goes on to improve your build times. No matter how many files your organization may create, AQL lets you assemble builds with any set of components, define highly specific cleanup policies, find all weird or unusual licenses on any set of artifacts and much more. With AQL you are not limited by repository type and can search on any field or property found in the repository. Every bit of data in your repositories has now become available for you to mine. Like most other repository managers, Artifactory supports local repositories where artifacts and builds can be deployed internally, and remote repositories that provide proxy and cache functionality for remote resources. Artifactory takes the concept of repositories a step further with virtual repositories. A virtual repository encapsulates any number of local and remote repositories and represents them as a unified repository accessed from a single URL. It gives you a way to manage which repositories are accessed by developers since you have the freedom to mix, match and modify the actual repositories included within the virtual repository. You can also optimize artifact resolution by defining the underlying repository order so that Artifactory will first look through local repositories, then remote repository caches, and only then Artifactory will go through the network and request the artifact directly from the remote resource. You can even set up a promotion pipeline in which artifacts pushed to the virtual repository are automatically directed to a specific included local repository. They are then promoted internally through additional repositories as they pass through the quality gates until they reach the production repository from which they are pulled as needed. For the developer it’s simple. Just push a package when it’s ready for QA or request a package needed for a build, and Artifactory will safely and optimally access it according to your organization’s policies. Artifactory’s advanced feature set, full support for all major packaging formats with comprehensive metadata, integration with all major build tools and CI systems and unique advanced technologies have made it the choice of thousands of companies in every industry. The most discriminating industry giants like Apple, Netflix, Oracle, VMware, Twitter, Yahoo, Credit Suisse and others enjoy enterprise features that no other repository manager can provide. With out-of-the-box integrations available through VMware, Pivotal (Cloud Foundry), CA (Nolio deployment tool), Microsoft (Azure), IBM (uDeploy), Chef, CloudBees and others, Artifactory will continue to lead the way, both technically and commercially, in the Binary Repository Management and Continuous Integration domain.